Come along and celebrate Christmas with us! Click on each of the posters below to see full details. The season of Advent is fast approaching and there’s lots going on to celebrate Christmas. Here are a few dates for your diaries – everyone is very welcome to take part in all or any of these events – we look forward to seeing you there! Carol Service 2014 at Heylipol Church on Sunday 21st December 6.00 pm. We will be singing the island’s favourite carols (cast your vote at the Co-op) so why not come along and enjoy an evening of well-loved carols, mince pies and mulled juice! 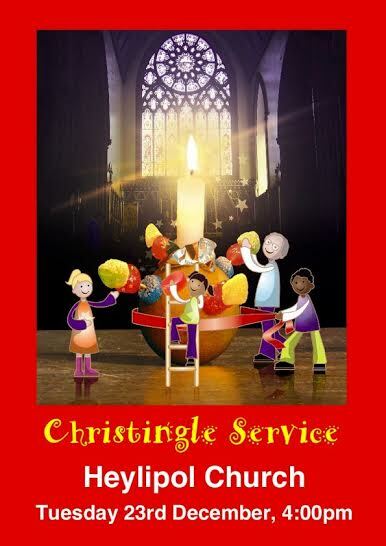 Christingle Service at Heylipol Church on Tuesday 23rd December 4.00 pm. 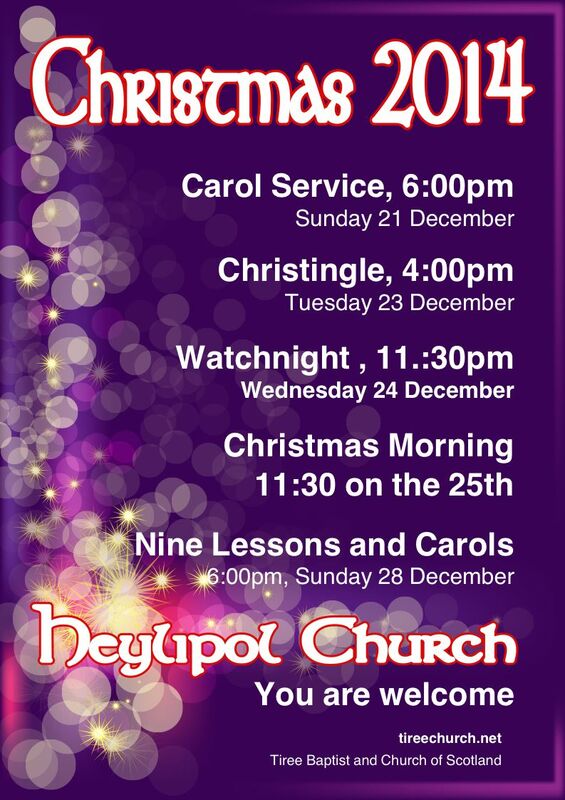 Watchnight Service at Heylipol Church on Wednesday 24th December 11.30 pm. 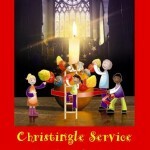 Christmas Morning Service at Heylipol Church on Thursday 25th December 11.30 am. 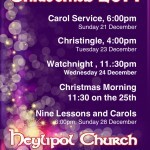 Nine Lessons and Carols Service at Heylipol Church on Sunday 28th December 6.00 pm. 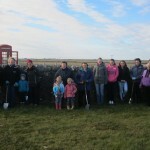 All of the above services are held jointly by the Tiree Church of Scotland and the Tiree Baptist Church. £160 and many boxfuls of groceries were donated at last Sunday’s Harvest Festival – what a wonderful achievement for our tiny community! These donations were given to the Lord’s Larder which is based in Oban. This organisation was set up in order to assist families and individuals who struggle to make ends meet. Food and toiletries are donated regularly and people in need are referred by the Social Work Department. Financial contributions are also welcome so that some fresh food can be included in parcels. The Lord’s Larder do not know who receives and do not wish to judge anyone, therefore the service is confidential and non-judgemental. Our grateful thanks go to all who contributed to such a worthy and essential project. The Church of Scotland report “Imagining Scotland’s Future: Our Vision” was launched on 26 February. The report is based on the views of over 900 people who attended 32 community events run by the Kirk as an alternative national debate on the referendum. The events were held across Scotland over the past 12 months. A joint church service was held in the Big Top (circus tent) at TMF this year on the Sunday morning. 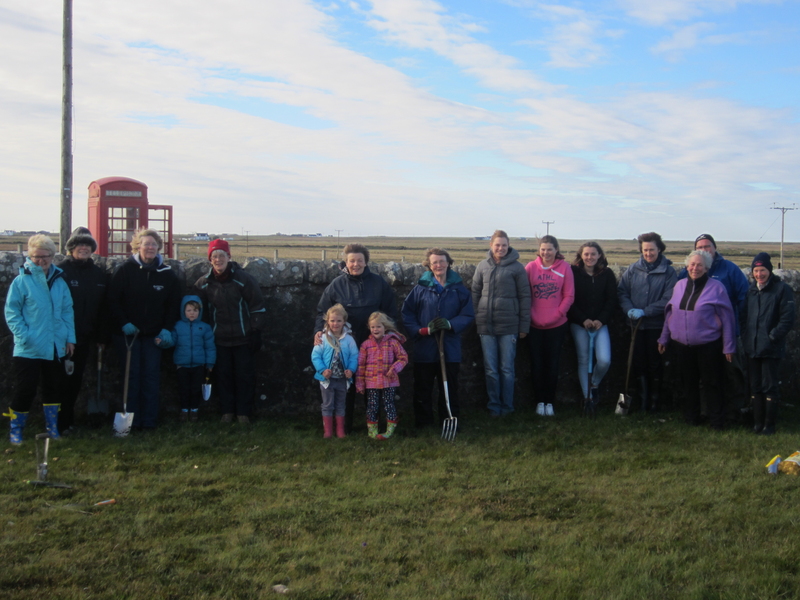 Over 100 people attended, and were led in worship by Rev Elspeth MacLean, Rev Paul Beautyman (Youth Advisor to Argyll Presbytery), and Alan and Ursula Millar of Tiree Baptist Church. The musicians were John Gunderson’s grandson Ewan on pipes, Katie England on fiddle, Ian Smith on accordion, Sue Bottomley on keyboard and her son Jim Bottomley on guitar. Ishbel Campbell sang a beautiful solo in Gaelic and English. Everyone was invited to write a prayer on a piece of fabric and all these were them woven together (see photo of ‘tripod’ with woven strips on each side, along with other photos of the event in the Gallery section of the website). On Sunday 20th July, there will be a joint service with Tiree Baptist Church at 10am in the Big Top in the middle of Tiree Music Festival. Refreshments will be served from 10am with the worship service starting between 10.30 and 11.00 am. Everyone is very welcome, (those who do not have tickets for TMF will be allowed in for the duration of the service). Hope to see you there! On Saturday morning the sky was blue, the sea like glass… an ideal day for a sail. A huddle of Tirisdeachs and members of the Oban & Lorne Strathspey and Reel Society clambered onto the good ship Islander (a catamaran actually) for a jaunt to the bonny Isle of Lunga. As we motored along at a not insubstantial pace, we were joined by a pod of around 100 dolphins. These curious and friendly creatures played beside our boat whilst cameras clicked, though they weren’t easy to photograph as they were so quick in the water! Not to be outdone, a minky whale swam silently past, but was unmoved by the commotion and disappeared as quickly as it had arrived. On arrival at Lunga we picked our way across the boulders on the shore and made for higher ground. It was a beautiful day for a picnic and having found a sunny spot amongst the bluebells we sat down to eat. However the lure of sandwiches lost its appeal when puffins congregated around us. These brightly painted birds are so tame and charismatic, and seemed quite happy to strike a pose for the camera! Two hours seemed to pass so quickly and then we were back on our boat and homeward bound… but our idyllic day was not yet over. On Saturday evening An Talla opened its doors to the community and the Oban & Lorne Strathspey and Reel Society treated us to a programme of traditional Scottish music. Fiddlers, box players, guitarists and a pianist joined together to fill the hall with beautiful haunting melodies followed by upbeat, toe tapping, hand clapping tunes. Our own young Tiree people also took a turn to entertain us – what a talent we have here on the island! All profits from the concert will go to the Heylipol Fabric Appeal Fund and we would like to say a big thank you to the Oban & Lorne Strathspey Society for their generosity, and also to the young musicians who took part and all who supported this event. (Photos from the trip to Lunga and of the concert are in the Gallery section of the website). Saturday 31st May 2014 at 7.30 pm – An Talla. Traditional Scottish tunes played by the Oban & Lorne Strathspey & Reel Society, plus music and songs from local artists. Proceeds from this concert will go to the Fabric Appeal for Heylipol Church. The fiddlers will also be performing at the morning Church service on Sunday 1st June which starts at the earlier time of 11 am. Everyone is very welcome to attend both events! 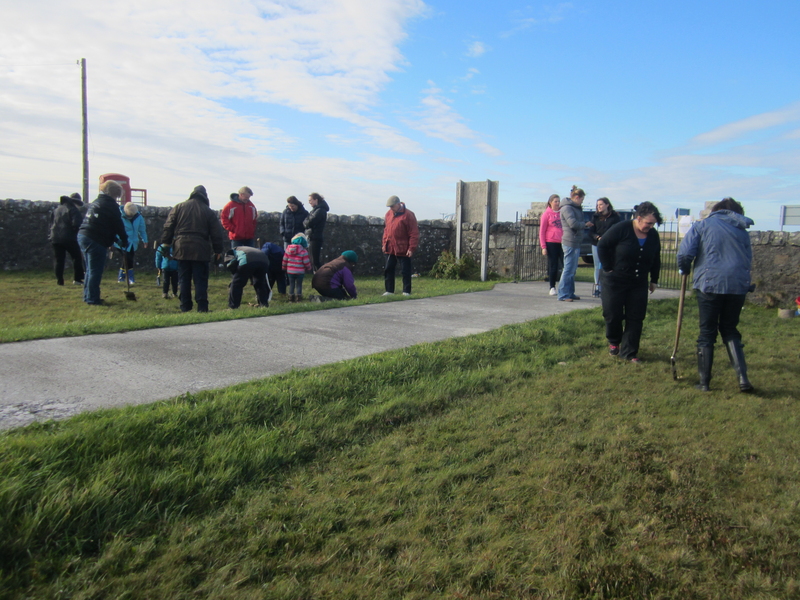 Why not join us for a weekend exploring and celebrating Tiree’s early Christian heritage and significance with visitors from St Andrew’s United Reformed Church, Leeds. Friday 16th May at 7.30 pm (An Talla) – An illustrated presentation “The Hebrides: Cradle of Light and pilgrim destination” by Rev David Pickering, introduced and chaired by Dr John Holliday, with question time/discussion. 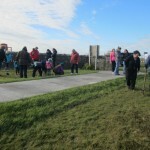 Saturday 17th May at 10.00 am (St Patrick’s Temple) – A pilgrims walk along the beach to St Patrick’s Temple, Balephuil Bay with an exploration of the site and concluding with a simple service with Holy Communion (for those who wish), jointly led by Rev Elspeth MacLean and Rev David Pickering. Meet at 10 am at the car parking area in the dunes mid-way along the beach. Please dress in appropriate clothing for the day. Sunday 18th May at 11.00 am – A pilgrimage themed service at An Talla with the combined Tiree churches and visitors from St Andrew’s. Sunday 18th May at 6.00 pm – An open reflective evening service at Heylipol Church concluding the pilgrimage weekend. Everyone is welcome at any or all of the above events and services. For more information contact Rev Elspeth MacLean on 01879 220377.